เมื่อชเตาฟ์เฟนแบร์กส่งสารถึงเทรสคอว์ผ่านร้อยโท ไฮนริช กรัฟ ฟอน เลนดอร์ฟฟ์-สไทนอร์ท ถามว่ามีเหตุผลที่พยายามลอบฆ่าฮิตเลอร์อ่นหรือไม่หากไม่มีความมุ่งหมายทางการเมือง เทรสคอว์ตอบว่า "ต้องพยายามลอบสังหาร ไม่ว่าต้องเสียอะไรก็ตาม แม้มันล้มเหลว เราต้องลงมือปฏิบัติการในกรุงเบอร์ลิน เพราะความมุ่งหมายเชิงปฏิบัตินั้นไม่สำคัญอีกแล้ว สิ่งสำคัญตอนนี้ คือ ขบวนการต่อต้านเยอรมันต้องตัดสินใจเบื้องหน้าสายตาชาวโลกและประวัติศาสตร์ เมื่อเทียบกับสิ่งนั้นแล้ว สิ่งอื่นก็ไม่สำคัญ"
↑ Hans Helmut Kirst "20th of July"
↑ Winston Churchill,war annual books, "1944"
↑ William L. Shirer "The Rise and Fall of the Third Reich", part IV, chapter "20th July"
↑ 6.0 6.1 Shirer 1960, p. 1393. ↑ Kutrz, Harold, July Plot in Taylor 1974, p. 224. ↑ 8.0 8.1 8.2 Kutrz, Harold, July Plot in Taylor 1974, p. 226. ↑ Fest, Joachim. Plotting Hitler's Death: The German Resistance to Hitler, 1933–1945, 1996, p. 219. ↑ Hoffmann, Peter. "Oberst i. G. Henning von Tresckow und die Staatsstreichpläne im Jahr 1943". ↑ Fest, Plotting Hitler's Death: The German Resistance to Hitler, 1933–1945, 1996, p. 220. ↑ Peter Hoffman (1996). The History of the German Resistance, 1933-1945. McGill-Queen's Press. ISBN 0-77-3515313. ↑ Michael C Thomsett (1997). The German Opposition to Hitler: The Resistance, the Underground, and Assassination Plots, 1938-1945. McFarland. ISBN 0-78-6403721. ↑ Galante, Pierre. 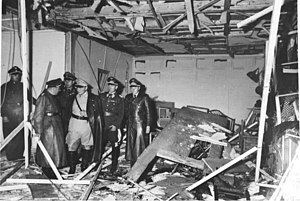 Operation Valkyrie. Harper and Row, 1981, ISBN 0060380020. Photo insert section. ↑ 24.0 24.1 Kutrz, Harold, July Plot in Taylor 1974, p. 227. ↑ Hoffman, Peter. The History of the German Resistance, 1933–1945, p. 426. ↑ Fest, Plotting Hitler's Death, pp. 270, 272. ↑ Taylor 1974, p. 227. ↑ William L. Shirer's Rise and Fall of the Third Reich, ch. 29. ↑ Kershaw, Ian. Hitler 1936–1945: Nemesis, p. 693. ↑ Tatiana von Metternich-Winneburg (1976). Purgatory of Fools. Quadrangle. p. 202. ISBN 0812906918. ↑ 33.0 33.1 See Shirer 1070–1071. ↑ Fest, Plotting Hitler's Death, pp. 289–290. ↑ "Alleged July Plot Conspirators Executed in Plötzensee Prison". Archived from the original on 14 May 2009. สืบค้นเมื่อ 19 April 2009. ↑ Pave the Way Foundation Reveals Evidence of Pope Pius XII's Active Opposition to Hitler, 29 June 2009. Accessed 4 September 2009. Archived 6 September 2009. ↑ Shirer attributes this anecdote to Allen Dulles in his book Germany's Underground, p. 83. ↑ Holocaust Denial on Trial: Using History to Confront Distortions. "Biographies: Otto Remer," (retrieved on 10 April 2009). ↑ "Hitler plot survivor dies aged 90". London: BBC News Online. 2 May 2008. ↑ The list of proposed appointments from The History of German Resistance 1933–1945 p. 367. ↑ Speer, Albert. Inside the Third Reich. ↑ 48.0 48.1 Beckett 2014, p. 6. ↑ Shirer 1960, pp. 1031, 1177. ↑ Hart 2014, pp. 139–142. ↑ Hart 2014, p. 140: Sourced to Speidel (1950) Invasion 1944: We Defended Normandy, pp. 68, 73. ↑ Evans 2009, p. 642. หน้านี้แก้ไขล่าสุดเมื่อวันที่ 26 มีนาคม 2562 เวลา 16:37 น.